Pumpkin as always been something that I like, but not something that I’m insanely over the moon in love with. A good pumpkin pie, scone, or muffin? Sign me up! Pumpkin beer? Tasty! Pumpkin spice tea? Sure, it’s nice sometimes. But pumpkin spice everything under the sun? Meh, that’s where you lose me. Needless to say, pumpkin isn’t something I always had a stash of in the house…until we got our dog. 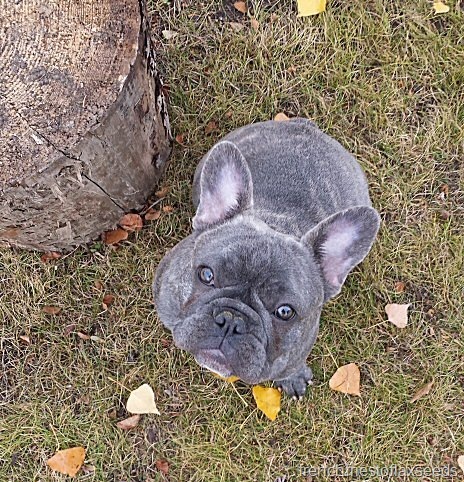 Turns out, pumpkin is great for keeping things moving smoothly (if you know what I mean) for your canine friend. So now we keep big ol’ cans on hand for our pup, which means we always have some open in the fridge. And well, when there are ingredients in the fridge, I can’t not use them to create something tasty for human consumption. I had been throwing scoops of pumpkin into my morning smoothies for a little while, then decided I wanted to switch things up. Fortunately I had also just received a bag of Prana Organic ProativChia Seeds to try out, so automatically I knew I needed to make some chia breakfast pudding. 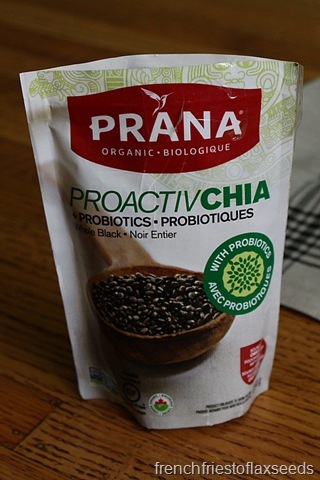 The Prana Organic ProactiveChia Seeds are an interesting product – they have somehow incorporated probiotics into (onto?) 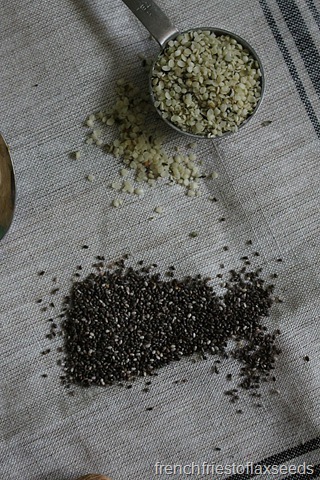 the chia seeds, so you get a dose of probiotics with all that fibre and omega-3’s naturally found in chia. For some reason I thought they were going to look different than normal chia seeds, but they didn’t. And turns out they work just as you would expect chia too, forming thick gels when mixed with liquid. 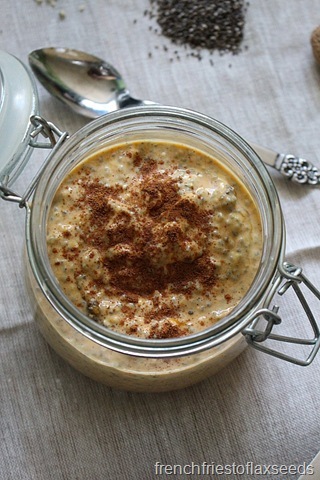 I decided to go for a classic pumpkin pie flavour combination, using warm spices like ginger, cinnamon, and nutmeg in the chia pudding. I went with kefir for my liquid, because why not continue on that probiotic theme (plus I’m all about the kefir over yogurt these days). And I added some raisins for some natural sweetness – and to make sure my boyfriend wouldn’t steal my breakfast! Overall, it turned out to be a tasty breakfast I could throw together the night before, and just grab on my way out the door to work the next morning. Which really, is my goal for pretty much every work day breakfast. 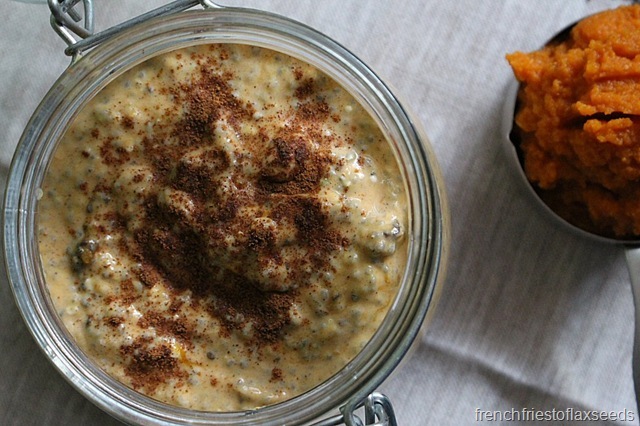 Pumpkin, ginger, cinnamon, and nutmeg all come together to bring a little taste of dessert to this nutritious and delicious breakfast. Make this easy chia pudding the night before and you’ll be flying out the door the next morning. 1. Combine all ingredients in a sealable container and let sit at least 30 minutes, or overnight. 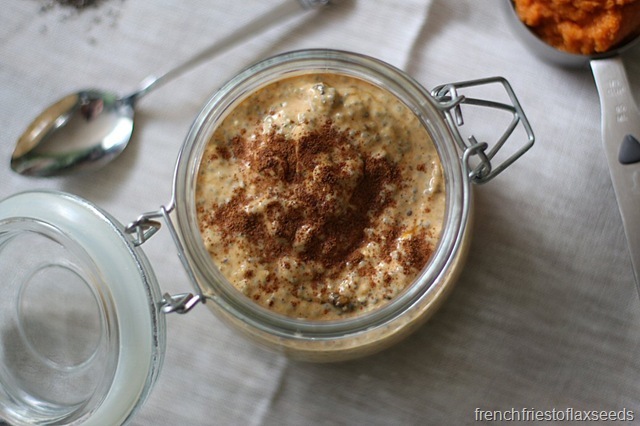 Top with some nut butter, maple syrup, or a sprinkle of cinnamon the next morning and enjoy! Disclaimer – all samples were provided to me free of charge from Prana Organic. All opinions are my own.